In the course of my various activities, it has become clear to me that Church itself is facilitating this twofold trend. All signs point to the trends becoming even more pronounced. I am very skeptical, in fact, that Christians of this generation are ever going to come to grips with the real reasons for their loss of stature in this country. In a sense, this essay is almost better served as a post-mortem, something to be looked at two generations hence, after it has finally and fully come to pass. I have invoked Julian the Apostate before on this blog. He intentionally sought to carry out the ‘good works’ that the Christians were doing, recognizing that the Christian proclamation of the Gospel was given significant credibility in the eyes of non-Christians because of the near miraculous nature of those ‘good works.’ What Julian the Apostate attempted to do as one hostile to Christianity, Christians themselves have wrought, in the name of Christianity. In the course of my research for my dissertation, which was on the topic of Darwinism and Eugenics, I had the opportunity to read a tremendous amount of primary source material in the time period of, say, 1890 to 1930. I frequently encountered people–Christians included–advocating that the time was right for a ‘Scientifically Managed Society’ (my phraseology, but see here) in order to fight all of our social ills. On top of that, I frequently encountered musings about how best to make the Church a less potent force in society (and they often meant by this, the Catholic Church). This was necessary, because the Church wouldn’t go along with the more extreme ‘Management’ proposals, such as wiping out the weak and/or forbidding them from reproducing. Taking the ‘duties’ of the Church over and having them done by the government, where, of course, the religious content and basis would have to be gutted to be ‘fair’ to the non-Christians in society (separation of ‘church and state’, anyone? ), was hinted at as one possible way forward. Eugenics was often put forward as a candidate for a new state religion for a somewhat related reason, in that it was seen that once the scientifically disproved religions were dispensed with, there would still be a need to fulfill man’s ‘spiritual’ needs. Google Haeckel’s monism to get started. 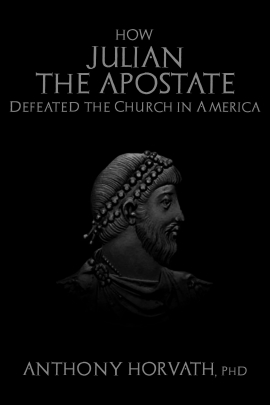 The American Church is experiencing the ‘actual effect’ right now, in pretty much exactly the fashion that Julian the Apostate, who certainly was intentional and deliberate, anticipated. As a case in point, even though the essay is written to Christians in particular, I let a British atheist friend of mine preview the essay. I guess I was interested to see if he might say, counter to my charge in the essay, “No, that’s not true! Secularists have not forgotten the valuable contribution that Christians made in erecting our innumerable social services!” A man can dream, right? But when I asked him about it, he seemed to miss the point completely, and in missing it, made it. I had said that I was not as familiar with how things went down in England as I am in the US, but that I would be willing to bet that even there, their national health service was brought about with the help and advocacy of Christians there. He protested, “In fact, our universal health system was established by the Labour party” (ie, liberals, and mostly of the non-Christian sort, I would guess). And look at where the United States is today, and where it is clearly going. Christian ‘charity’ is not by any means the only thing that the State has taken over that originally was motivated largely by Christian concerns. Many Christians have already spent some time talking about these, probably most prominently education. My essay addresses ‘charity’ in part because it was a subtext of much of the debates of the Progressive movement which I studied so much, but also because I think it is one of the most vivid examples of something that has become almost thoroughly politicized which, at least from a Scriptural point of view, was always represented as something that individuals or small groups of Christians were responsible for. In this kind of context, it is not hard to predict what the outcome will be. The sad thing is that Christians, past and present, have been complicit in creating this ‘context’ in the first place. You may purchase this ebook on the Kindle, here. P.S., the short answer to, “Many people, think Christians only care about abortion and gay marriage. Since that is not true, how did this impression come about?” is, “Christians have given every other issue over to the state to manage. These were… until recently… the only two issues left.” Without even these, the Church in America is on the verge of complete irrelevance.